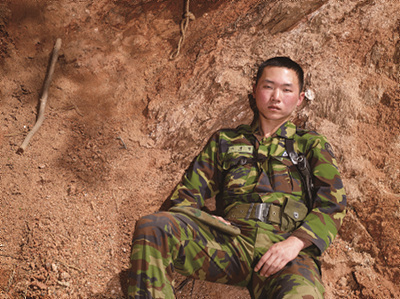 Hein-kuhn Oh, A corporal on red clay, May 2010, 110 x 147 cm, digital c-print. 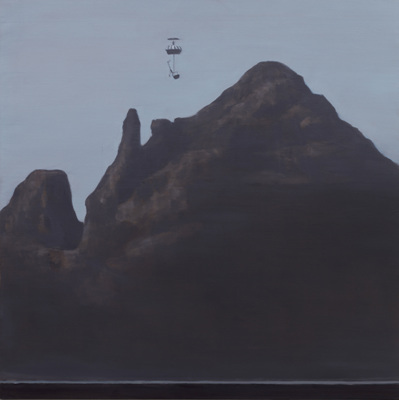 정연두, 박찬경, 함경아, 오형근은 영국 노팅엄의 New Art Exchange에서 열리는 《The Real DMZ: Artistic encounters through Korea’s demilitarized zone》에 참가한다. The Real DMZ 프로젝트는 한반도의 비무장지대 DMZ와 그 접경지역에 관한 연구를 바탕으로 진행하는 동시대 미술 프로젝트로, 2017–18 한영 상호교류의 해를 맞이하여 영국 노팅엄의 New Art Exchange에서 8명의 한국 작가들은 분단과 긴장을 포함한 북한에 대한 여러 인식들을 다루는 작품들을 선보인다. 정연두의 신작과 함께 함경아는 매체에서 은연중에 다뤄지는 북한에 대한 이미지에 의문을 제기하며 새로운 인식을 전달하는 작품을 출품한다. 오형근은 사진작업으로 폭력의 대립상황을 포착하고, 박찬경은 순하고 어린 북한의 소년병의 모습으로 북한의 인간적인 모습을 그려낸 신작 영상작품을 선보인다. Yeondoo Jung, Park Chan-kyong, Kyungah Ham, and Hein-kuhn Oh are featured in a group exhibition titled The Real DMZ: Artistic encounters through Korea’s demilitarized zone at New Art Exchange in Nottingham, England. The Real DMZ Project is a contemporary art project based on research conducted on the DMZ (Demilitarized Zone) in South Korea and its border area. As part of Korea/UK 2017-18, a celebration of British and Korean art and culture, the exhibition invites eight South Korean artists who address the reality of the division of the Korean peninsula—the persisting violence, tension and various perceptions of North Korea. The installation includes new work by Yeondoo Jung, along with embroidery pieces by Kyungah Ham that question the representations of North Korea that permeate the mainstream media and provide new, inventive possibilities of imagining the North. Also part of the show are Hein-kuhn Oh's photographs that portray conflicting moments of violence, anxiety, and absurdity, and Park Chan-kyong's new video work that reveals the vulnerable, humanistic sides of North Korea through ordinary and tender moments of childhood. 김수자와 구본창은 주홍콩한국문화원에서 열리는 《接點開花 (접점개화)》 전에 참가한다. 2017년 겨울 전세계 32번째로 개관한 주홍콩한국문화원은 한국과 홍콩의 문화 교류를 위한 플랫폼으로서 활발한 활동을 전개해나갈 것이다. 1월 25일부터 3월 31일까지 개최되는 이번 전시에는 19명 작가들의 단색화를 비롯한 아방가르드 미술, 미디어 아트 등 1970년부터 현재에 이르는 다양한 한국 근대미술 작품들 31여점이 소개되어 한국 미술의 저변을 보여줄 예정이다. 구본창은 <B&W vessels> 시리즈 3점을 출품한다. Kimsooja and Koo Bohnchang are featured in a group exhibition titled Blooming at the Junction from January 25 to March 31, 2018, at the Korean Cultural Center Hong Kong (hereafter KCCHK). The KCCHK opened its doors in winter of 2017 as the 32nd Korean Cultural Center outpost; the platform will spearhead activities that promote cultural exchange between Korea and Hong Kong. This exhibition introduces over 31 works of art by 19 Korean artists whose practices emerge from discrete movements of modern and contemporary art history from the 1970s to the present, including Dansaekhwa, the Korean avant-garde, and media art. Koo Bohnchang will showcase three photographs from his B&W vessels series. 노충현은 2018년 1월 23일부터 3월 25일까지 북서울미술관 프로젝트갤러리 1, 2에서 개최되는 기획전 《두 번째 풍경》에 참가한다. 이번 전시에서 소개되는 김기수, 김상균, 노충현, 뮌, 안창홍, 이창원, 장종완, 홍순명, 황세준 등 총 9명의 작가 작품들은 평범한 일상, 아름다운 풍경을 그린듯하지만 실은 외연에 가려진 물질만능주의, 사회의 불안과 동요, 희생, 고단한 일상 등을 담담하고 우회적이며 유머러스하게 담아내고 있다. 이를 통해 겉으로 보이는 대한민국의 풍경 이면의 진짜 풍경, 두 번째 풍경을 들여다보는 기회를 제공한다. 노충현은 2006년부터 선보여 온 텅 빈 동물원을 소재로 우리를 둘러싼 정치, 사회적인 상황과 인간 존재에 대해 발언해 온 <자리> 연작 중 <원숭이>, <코끼리>, <두개의 공>, <연극이 끝난 후> 등을 출품한다. Choong-Hyun Roh is featured in a group exhibition titled The veiled landscape from January 23 to March 25, 2018, at the SeMA Buk Seoul Museum of Art. This exhibition introduces works by nine artists including Kim Kisoo, Kim Sang Gyun, Choong-Hyun Roh, MIOON, Ahn Chang-hong, Changwon Lee, Jang Jongwan, Hong soun, and Hwang Sejun. While the works on view seem to portray the mundane everyday life and alluring landscapes on the surface, the images conceal the underlying materialism, uncertainties of today's society, sacrifice, and fatigue in a composed, oblique, and humorous manner, providing an opportunity to delve into an alternative Korean landscape that remains veiled underneath the façade. 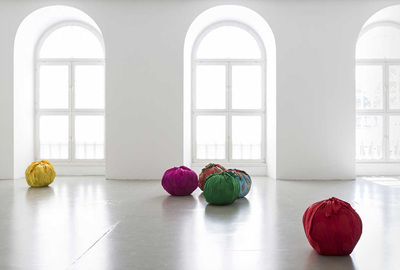 Four paintings from Roh's Jari (2006 -) series, each titled A Monkey, An Elephant, Two Balls, and After a Play Ends, are on view; the Jari series is one of Roh's most important ongoing series that depicts an empty zoo as a metaphor to reflect on today's sociopolitical climate and human existence in contemporary society.